A test capable of detecting HIV early using more efficient, robust methods has been developed by researchers at Imperial. The test in question could also be adapted to be used in other infectious diseases such as Ebola and Zika. In recent years, diseases such as Ebola and Zika have caused wide-scale devastation, and HIV continues to be a pandemic health threat for many. The problem is particularly prominent in developing countries, where infectious diseases often go undetected for long periods of time, resulting in widespread epidemics. To manage infectious disease outbreaks more effectively, vast efforts are being made to create tests that allow for early diagnosis. Currently, cheap point-of-care methods employed to detect infectious diseases have their limitations, particularly when it comes to detecting very low levels of markers in the blood. Now, Imperial researchers, alongside their collaborators at University College London as part of the i-sense program, have developed a new diagnostic tool for HIV that is affordable, capable of withstanding harsh conditions and highly sensitive, making the early detection of the disease possible. The research, led by Imperial Professor Molly Stevens' team of researchers and published in ACS Nano, refined a current diagnostic method known in the field as a lateral flow immunoassay, a similar method employed by pregnancy tests. In the case of HIV, if a patient is positive, virus components present in the blood will bind to coloured particles on the paper test, indicating HIV infection. 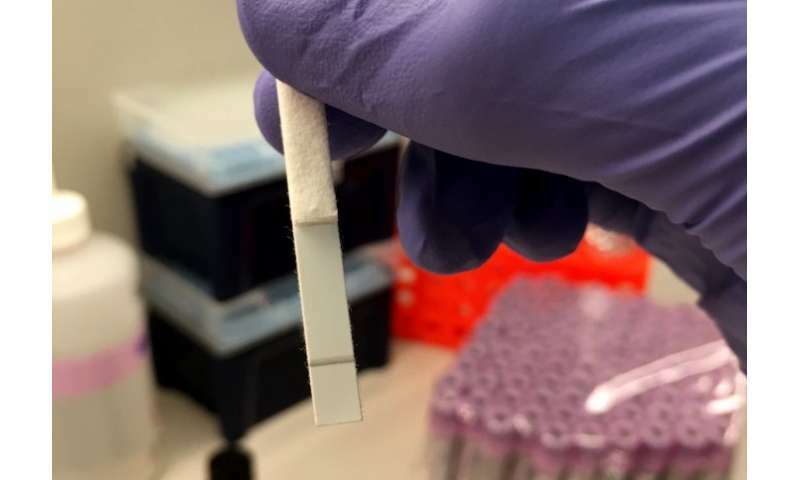 Co-first author Dr. Mike Thomas from the Department of Materials at Imperial said: "To the best of our knowledge, our newly developed test is the simplest and most sensitive colourimetric paper-based lateral flow diagnostic test for HIV to date." This newly developed technology employs a similar technique to the lateral flow immunoassay, but is far more sensitive, meaning it can detect HIV even when the level of the virus in the blood is very low, allowing for earlier diagnosis. The test senses a protein called p24, found on the outside of the HIV virus, which acts as a biomarker of the disease. By incorporating an 'amplification stage' to the standard immunoassay, which acts to increase the signal produced by p24 up to 100-fold, the team were able to detect the presence of the virus with sensitivity surpassing that of the current industry standard tests. Postdoctoral Research Associate Dr. Eleanor Gray from UCL said: "The test, which uses llama antibodies made by the i-sense McKendry group at UCL, includes an amplification step that triggers a colour change at the test line when small quantities of p24 are present, even during very early stages of HIV infection." The idea is that the results produced from the test will be able to be read by a mobile phone camera through an app, making it easier for community health workers to diagnose and treat HIV in developing countries. Co-first author Colleen Loynachan from the Department of Materials at Imperial said: "Because our test components show extraordinary long-term stability and sensitivity, we believe our amplified lateral flow technology has high potential for translation into field test settings." Researchers say the test, which in this case was developed for use in HIV, could be repurposed and applied to a broad range of infectious diseases, potentially allowing for the early detection of diseases such as Ebola and Zika, limiting the devastation infectious disease outbreaks can cause.